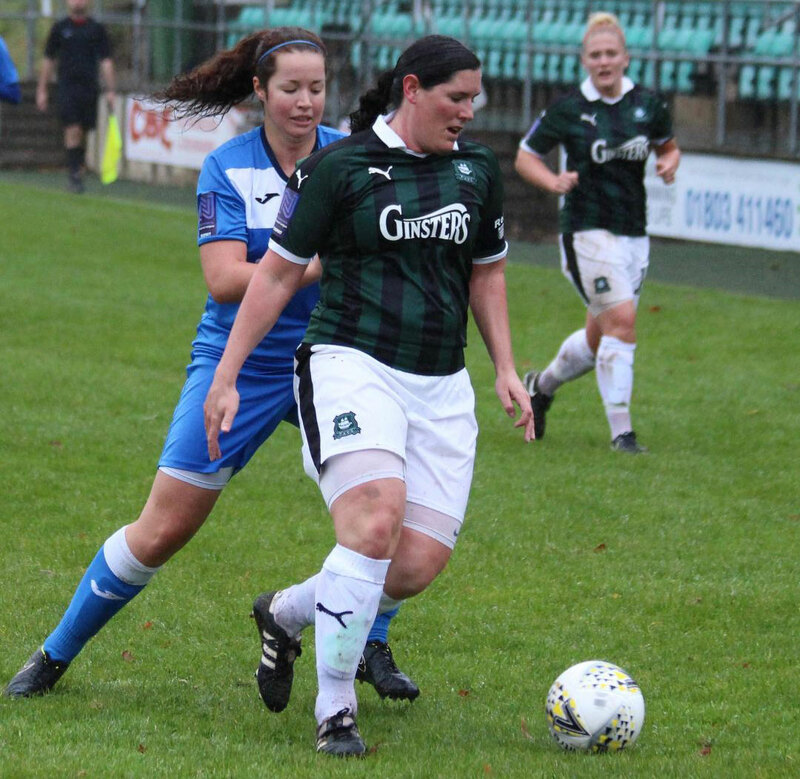 Plymouth Argyle Ladies put up a superb performance before going out of the League Cup 5-3 after extra-time against a Crawley Wasps outfit who are carrying all before them this season. Crawley, who play in the National League South East Division One, have now won all of their 19 games played to date and have beaten the top two in Argyle’s league, Chichester City and Coventry United in cup competitions, and are due to play Arsenal in the FA Cup. Argyle received some bad news before the kick-off as influential midfielder Becky Dandridge had to drop out through illness. However, Jessica Jones returned after missing the previous week’s game against Chichester City through sickness, while Kayley Lane and Panagiota Papaioannou took their places on the bench after returning from holiday. In an even first half, Argyle held their own but went behind when good work on the left wing resulted in Sian Heather giving the visitors the lead. The Pilgrims then suffered the loss of defender Ebony Dover through injury, with Papaioannou coming on to replace her. Crawley increased their lead when substitute Kay Webber scored minutes after coming on. It looked all but over until 15 minutes from time when Argyle got the break they needed when a Helen Bleazard corner was headed in at the near post by substitute Kayley Lane. The hosts now had their tails up and injury-time they were awarded a free-kick. Up stepped captain Kate Middleton, who did what she does best to send a pile driver into the roof of the net to take the game into extra-time. This eventually proved to be a step far as their great efforts to take the game into extra-time took its toll and legs began to tire. Webber struck to regain the lead for Crawley. But Argyle showed immense courage and drew level again when Zoe Cunningham worked some magic on the wing before pulling the ball back for Leah Burridge to score from close range. Unfortunately despite their best efforts in strength-sapping conditions, Faye Rabson scored a great solo effort which left Webber to complete her hat-trick to earn a fourth round tie. Fellow joint manager Dave Leonard was equally proud of the side. He added: “They did everything I asked them to do against the most in-form team in the country. It was a great spectacle of football. 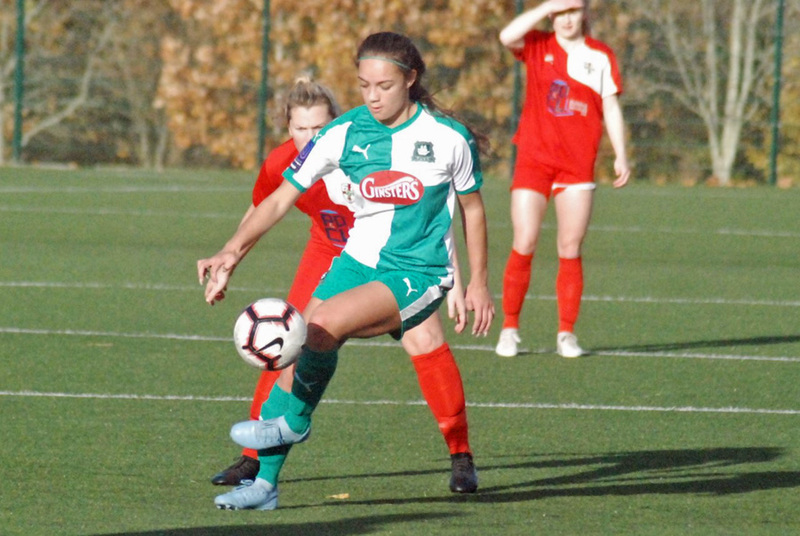 Gabi Alphous scored twice to take her tally for the season to 17 as Argyle’s development team battled hard to overcome fellow title-chasers Alphington 4-3 in the South West League Western Division. However, the win did come at a cost with goalkeeper Claire Squires, who injured her hand before the match, having to be replaced at half-time by captain Alex Hugh, who was herself carrying an injury. Argyle also lost substitute Rachel Heron who had only been on the field for ten minutes before she too was injured. Argyle, playing their final home match of the season, were quick out of the blocks and soon had their visitors on the back foot. After Alphous and Nicola Champion had good chances, the hosts took the lead when Faye Ivall headed in a Kelly Vinnicombe corner at the near post. Within minutes it became 2-0 when their high pressing game forced the Alphington defence into a mistake and Nicola Champion latched on to the loose ball and stroked the ball home. Argyle continued to put Alphington under pressure and would not allow them any space or time on the ball. However, the host’s defence had to be at their best as Helen Kukor was always looking to use her pace for the ball over the top. In the 25th minute a smart move involving Sally Salter and Tamsin Medd-Gill set up Kiara Robins, whose fierce drive was well saved by the Alphington goalkeeper but Alphous was first to react to score from close range. It all seemed plain sailing up until that point but unfortunately the young Greens took their foot off the pedal and slowly Alphington started to get more of a grip and five minutes before half-time it was Kukor who reduced the arrears to make it 3-1. Argyle were forced to make a change in goal at half-time as Squires could not carry on. Skipper Alex donned the gloves and Abbie Scurr came on in a defensive re-shuffle. The tide had turned and the visitors soon had another goal to celebrate and it was Kukor who scored from inside the six yard box. Argyle attacks were infrequent but Robins and Champion both had shots saved comfortably from range. Midway through the half a rash challenge saw Alphington win a free-kick 20 yards out which Laura Burwood fired into the net. Argyle brought on Rachel Heron in a defensive move to try and stem the flow of attacks but unfortunately she lasted less than ten minutes before she picked up an ankle injury and was carried from the field. Although the game was now a more even affair, Argyle managed to get a foot hold and pushed forward once more. With 15 minutes remaining it was Kelly Vinnicombe the provider who found Alphous, who in turn raced clear of the visitors defence and shot across the goalkeeper into the far corner of the net. Alphington tried to grab the equaliser but the Argyle defence stood firm to grab a hard earned victory. Manager Rob Bonney said: “This team has come a long way during this season and this was billed as their biggest test to date. They played with a great tempo and confidence at the start of the game and deserved to be 3-0 up. They then relaxed and were certainly punished for it. Development Squad: Claire Squires, Tamsin Medd-Gill, Becky Parkyn, Alex Hugh(Abbie Scurr), Jodie Randall, Sally Salter (Rachel Heron), ( Maya Ridge), Kiara Robins, Kelly Vinnicombe, Nicola Champion, Gabi Alphous, Shania Fenlon, Hannah Brock.